Download "Algebra III. Lesson 33. 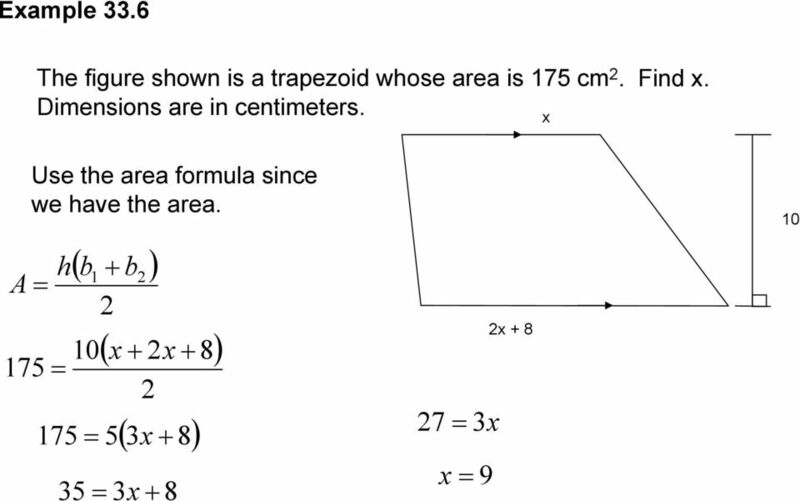 Quadrilaterals Properties of Parallelograms Types of Parallelograms Conditions for Parallelograms - Trapezoids"
2 Quadrilaterals What is a quadrilateral? Quad means? 4 Lateral means? side A quadrilateral is a 4 sided polygon (figure). 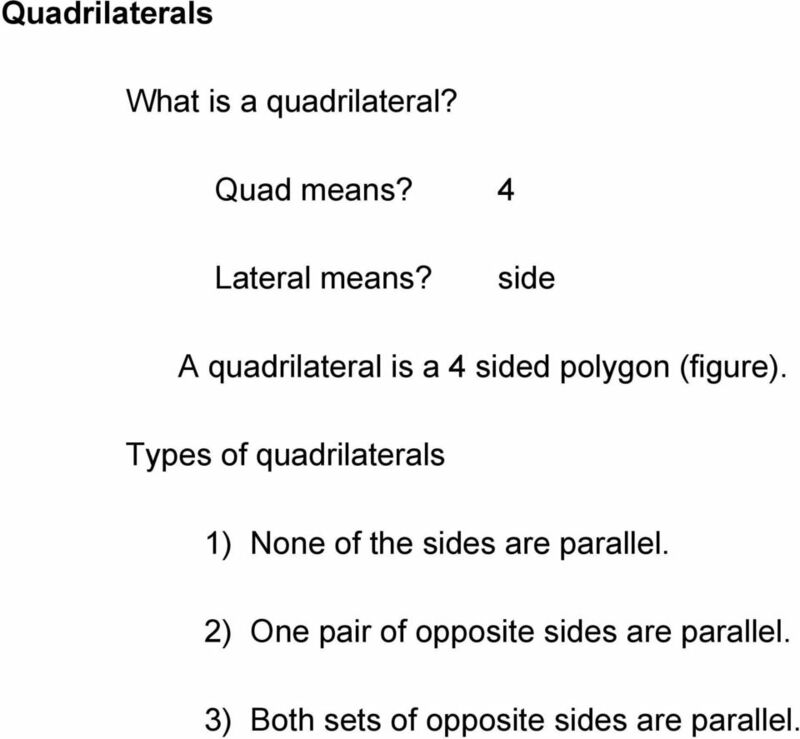 Types of quadrilaterals 1) None of the sides are parallel. 2) One pair of opposite sides are parallel. 3) Both sets of opposite sides are parallel. 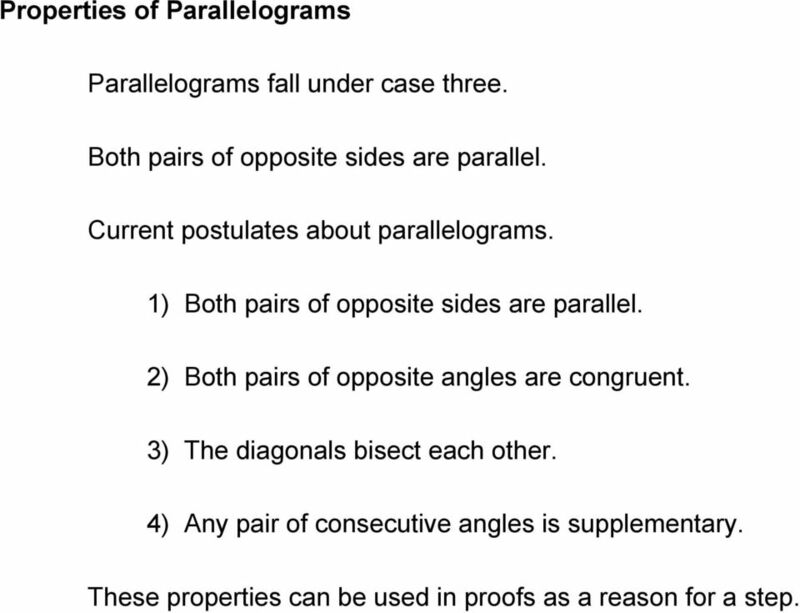 3 Properties of Parallelograms Parallelograms fall under case three. Both pairs of opposite sides are parallel. 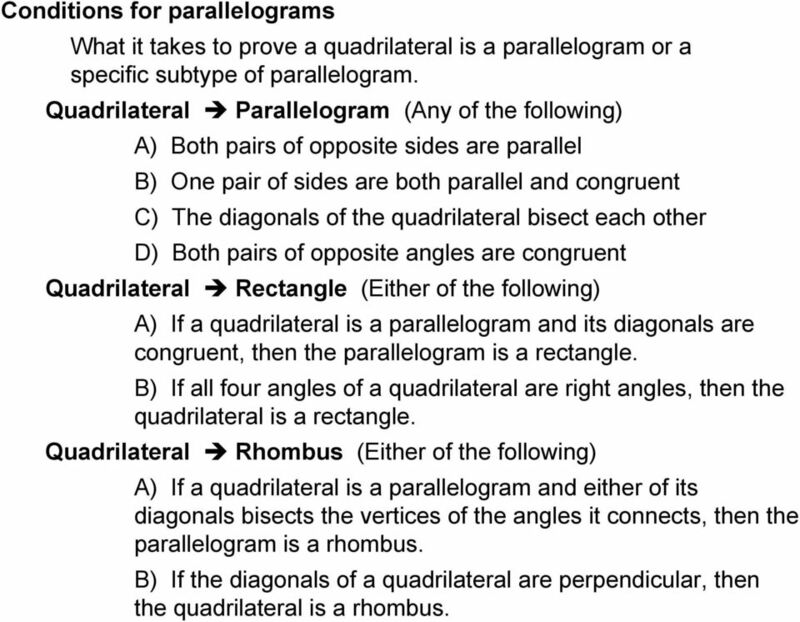 Current postulates about parallelograms. 1) Both pairs of opposite sides are parallel. 2) Both pairs of opposite angles are congruent. 3) The diagonals bisect each other. 4) Any pair of consecutive angles is supplementary. These properties can be used in proofs as a reason for a step. 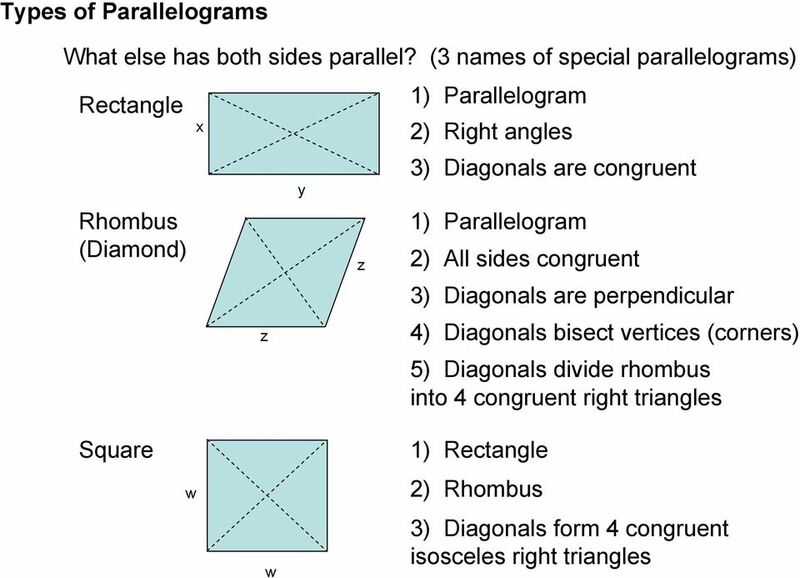 7 Conditions for parallelograms What it takes to prove a quadrilateral is a parallelogram or a specific subtype of parallelogram. Quadrilateral Parallelogram (Any of the following) A) Both pairs of opposite sides are parallel B) One pair of sides are both parallel and congruent C) The diagonals of the quadrilateral bisect each other D) Both pairs of opposite angles are congruent Quadrilateral Rectangle (Either of the following) A) If a quadrilateral is a parallelogram and its diagonals are congruent, then the parallelogram is a rectangle. B) If all four angles of a quadrilateral are right angles, then the quadrilateral is a rectangle. Quadrilateral Rhombus (Either of the following) A) If a quadrilateral is a parallelogram and either of its diagonals bisects the vertices of the angles it connects, then the parallelogram is a rhombus. B) If the diagonals of a quadrilateral are perpendicular, then the quadrilateral is a rhombus. 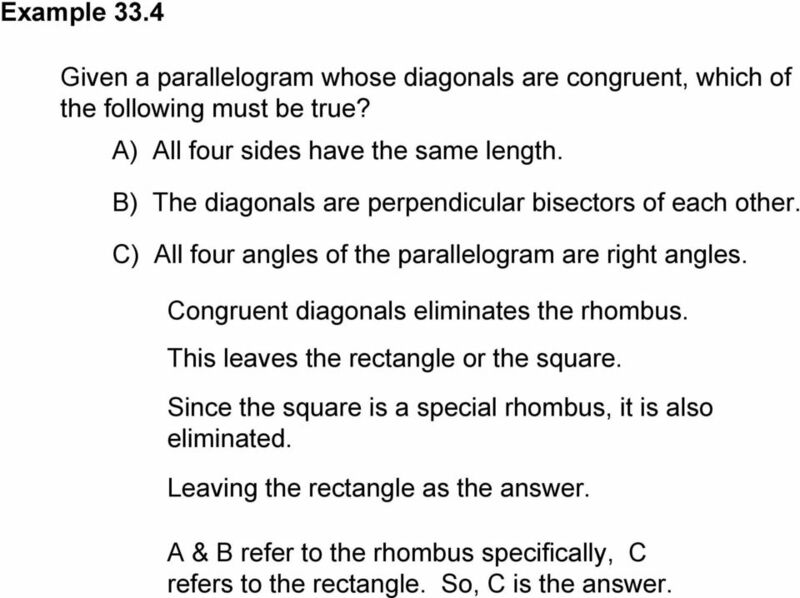 8 Example 33.4 Given a parallelogram whose diagonals are congruent, which of the following must be true? A) All four sides have the same length. B) The diagonals are perpendicular bisectors of each other. 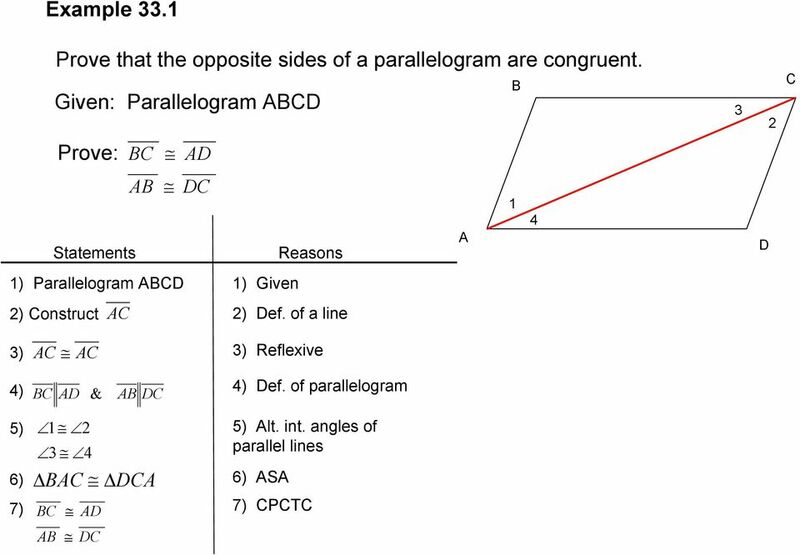 C) All four angles of the parallelogram are right angles. Congruent diagonals eliminates the rhombus. This leaves the rectangle or the square. Since the square is a special rhombus, it is also eliminated. Leaving the rectangle as the answer. A & B refer to the rhombus specifically, C refers to the rectangle. So, C is the answer. 9 Trapezoids A quadrilateral with only one pair of parallel sides. The parallel sides are called the bases of the trapezoid. 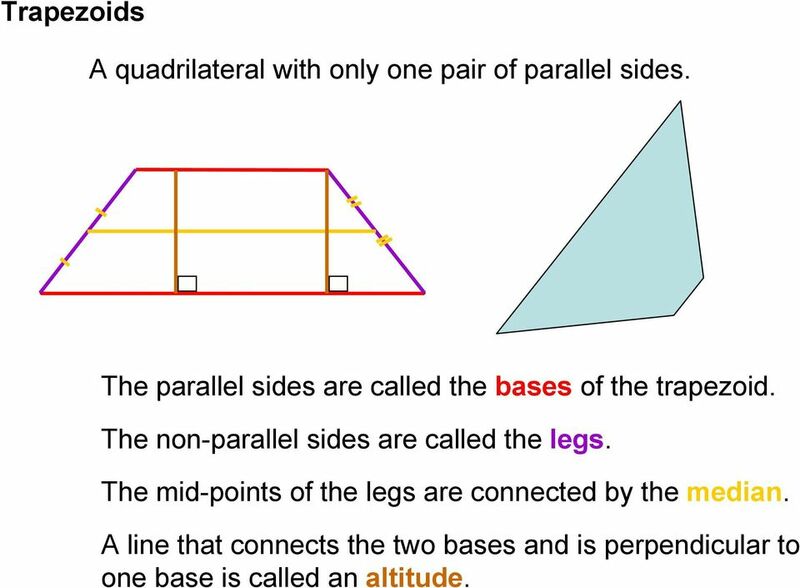 The non-parallel sides are called the legs. The mid-points of the legs are connected by the median. A line that connects the two bases and is perpendicular to one base is called an altitude. 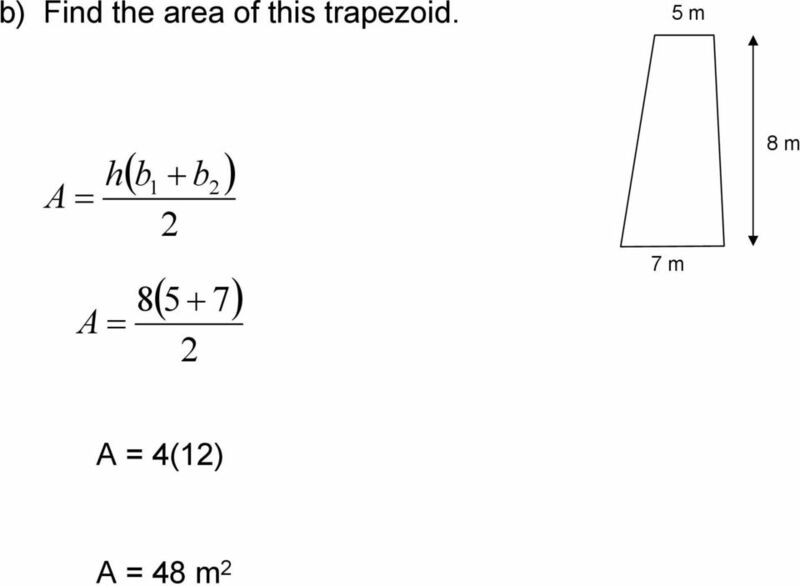 10 Properties of a Trapezoid 1) The area of a trapezoid equals one half the product of the length of the altitude (height) and the sum of the bases. A = ( + ) h b 1 b 2 2 2) The median of a trapezoid is parallel to the bases, and its length is one half of the sum (average) of the lengths of the bases. 11 Isosceles Trapezoids A trapezoid where the legs are of equal length is an isosceles trapezoid. A B C D In this trapezoid, B & C are the upper base angles and A & D are the lower base angles. 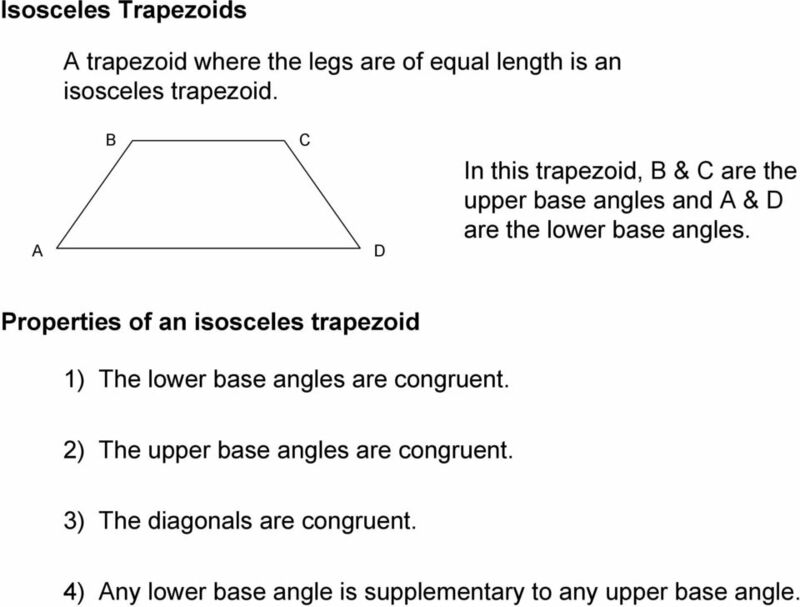 Properties of an isosceles trapezoid 1) The lower base angles are congruent. 2) The upper base angles are congruent. 3) The diagonals are congruent. 4) Any lower base angle is supplementary to any upper base angle. 16 Practice a) All four sides of a certain quadrilateral have the same length. Which of the following must the quadrilateral be? 1) Rectangle 2) Square 3) Rhombus 4) Trapezoid Four equal sides knocks out? Rectangle & Trapezoid Leaving Square & Rhombus. 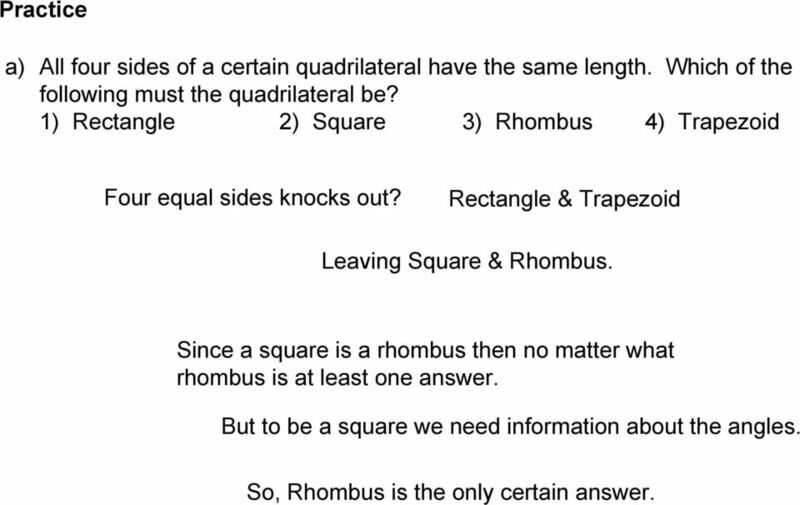 Since a square is a rhombus then no matter what rhombus is at least one answer. But to be a square we need information about the angles. So, Rhombus is the only certain answer. 1. An isosceles trapezoid does not have perpendicular diagonals, and a rectangle and a rhombus are both parallelograms. 6-5 Rhombi and Squares. ALGEBRA Quadrilateral ABCD is a rhombus. Find each value or measure.
. Sum of Measures of Interior ngles Geometry 8-1 ngles of Polygons 1. Interior angles - The sum of the measures of the angles of each polygon can be found by adding the measures of the angles of a triangle. 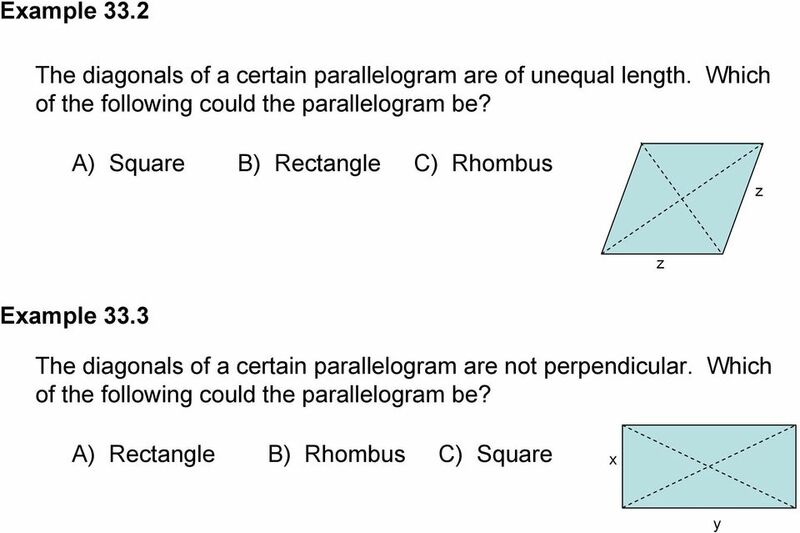 6-3 Tests for Parallelograms. 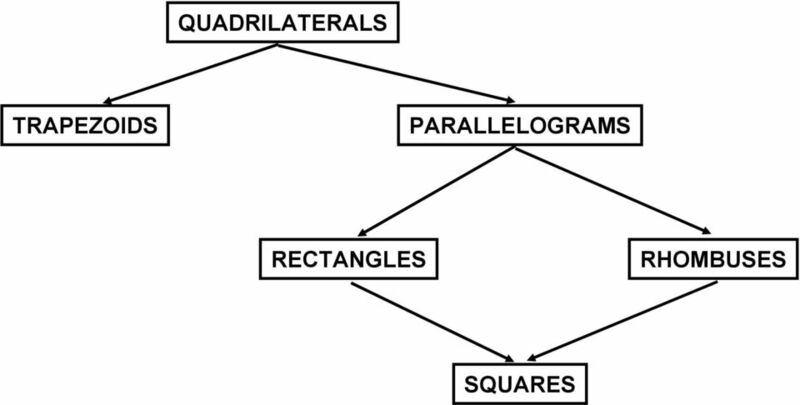 Determine whether each quadrilateral is a parallelogram. Justify your answer. You can use the postulates below to prove several theorems. 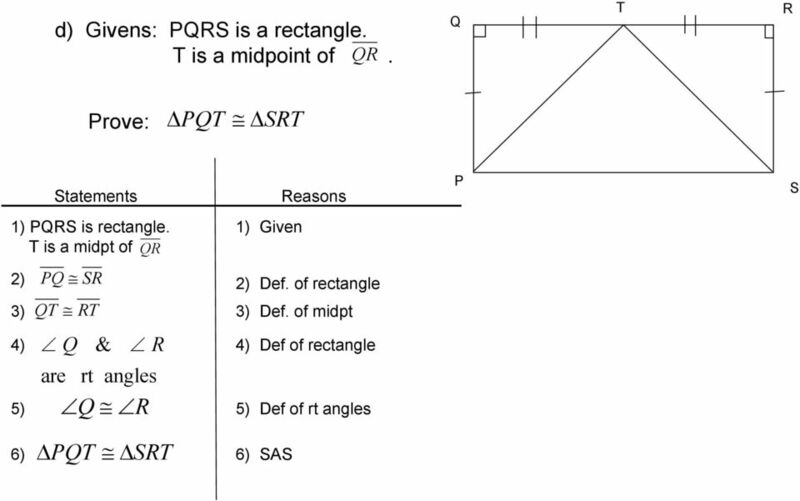 Using Area Formulas You can use the postulates below to prove several theorems. AREA POSTULATES Postulate Area of a Square Postulate The area of a square is the square of the length of its side, or s.
Math 531, Exam 1 Information. **The Ruler Postulate guarantees that you can measure any segment. **The Protractor Postulate guarantees that you can measure any angle. The Parallelogram REMEMBER A parallelogram is a quadrilateral with opposite sides parallel. It has many special properties. The University of the State of New York REGENTS HIGH SCHOOL EXAMINATION GEOMETRY. Wednesday, January 29, 2014 9:15 a.m. to 12:15 p.m. 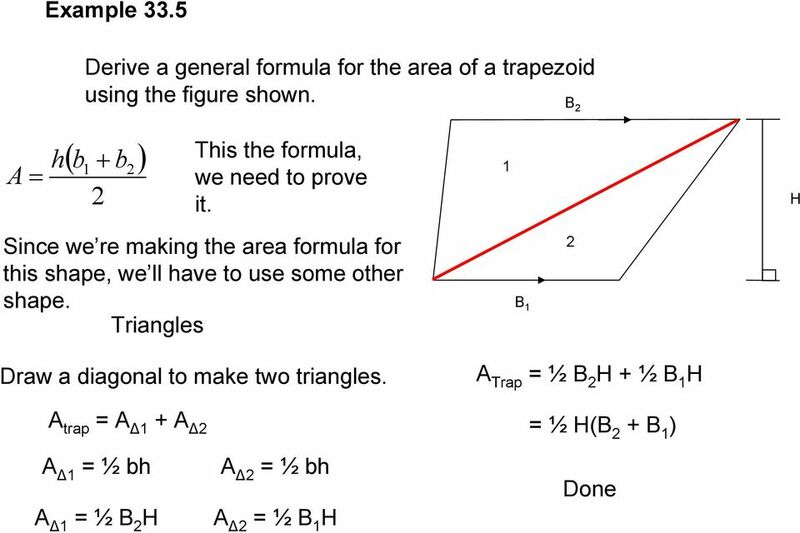 Define: Area: Area Overview Kite: Parallelogram: Rectangle: Rhombus: Square: Trapezoid: Postulates/Theorems: Every closed region has an area. If closed figures are congruent, then their areas are equal. *1. Derive formulas for the area of right triangles and parallelograms by comparing with the area of rectangles. The University of the State of New York REGENTS HIGH SCHOOL EXAMINATION GEOMETRY. Thursday, August 13, 2009 8:30 to 11:30 a.m., only. Postulate 17 The area of a square is the square of the length of a. Postulate 18 If two figures are congruent, then they have the same. Chapter 11. 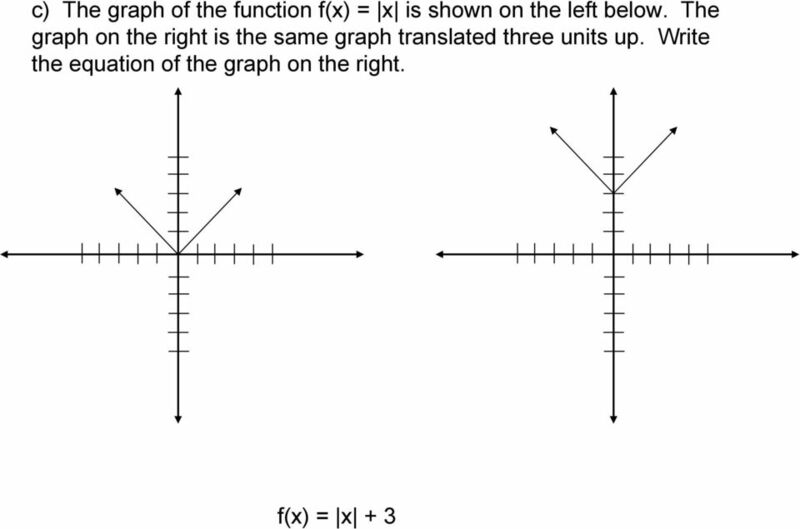 Areas of Plane Figures You MUST draw diagrams and show formulas for every applicable homework problem! Line. A straight path that continues forever in both directions. The University of the State of New York REGENTS HIGH SCHOOL EXAMINATION GEOMETRY. Wednesday, January 28, 2015 9:15 a.m. to 12:15 p.m.